The Saskatoon Police Service Traffic Unit is committed to ensuring the safety of all Saskatoon residents and visitors to our city who share our roads, sidewalks, and bike trails. In addition to enforcement activity, the Traffic Unit also encompasses collision and hit and run investigations. Our enforcement team uses selective techniques, as well as targeted traffic projects, and a variety of educational campaigns in order to maximize compliance with provincial and municipal driving legislation. Police officers are highly trained in the use of Radar and Laser speed detection technology, and are equipped with the latest tools of the trade to effectively perform their duties. They use a variety of vehicles, including motorcycles to patrol our streets. 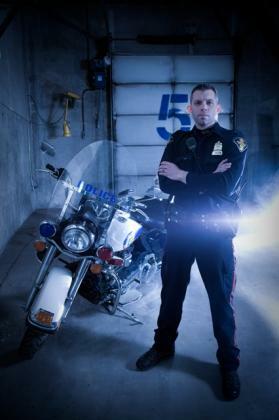 Saskatoon Police Traffic officers regularly team up with outside agencies such as the Saskatchewan Highway Transport Patrol, Vehicle Equipment Compliance inspectors, University of Saskatchewan Campus Patrol, RCMP and other municipal police services for the purpose of safety campaigns. Operation Street Sweep, Multi Agency Seat belt Team (MAST), Operation Overdrive Sobriety Checkpoints and child seat safety clinics are but a few examples of this collaborative effort geared towards the creation of a safe roadway network. For any questions or concerns related to traffic safety, please feel free to contact the Saskatoon Police Traffic Unit at 306-975-8068. Combined Traffic Services Saskatchewan includes two integrated units, a partnership between the Saskatoon Police Service Traffic Unit, the RCMP and SGI. The creation of these units came as a recommendation from the Saskatchewan Legislature all-party traffic safety report and when the laws for distracted, impaired and excessive speeding changed to include harsher penalties. Each unit consists of 30 officers, 15 from existing provincially funded positions and 15 new officers funded by SGI. Of these, 50 officers (25 per unit) are RCMP officers and 10 (5 per unit) are SPS members. 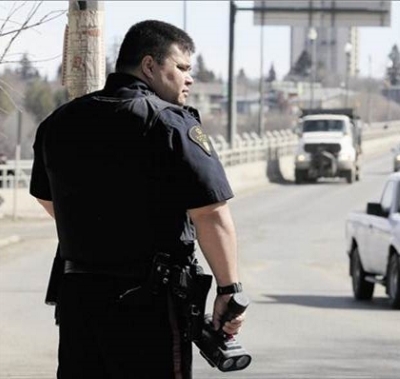 These two units enforce traffic laws on highways in central and southeastern Saskatchewan. Operation Overdrive is a high profile program aimed at discouraging motorists from driving while impaired. Drinking and driving continues to be a problem in Saskatoon with injuries and death all too often being the end result. Operation Overdrive, funded in part by Saskatchewan Government Insurance, involves Saskatoon police officers conducting checkstops throughout the year. When a motorist encounters an Operation Overdrive checkstop, he or she will be directed to a safe location at the side of the road where a police officer will ask them about alcohol consumption. In situations where the driver has consumed alcohol, a roadside breath test may be conducted. 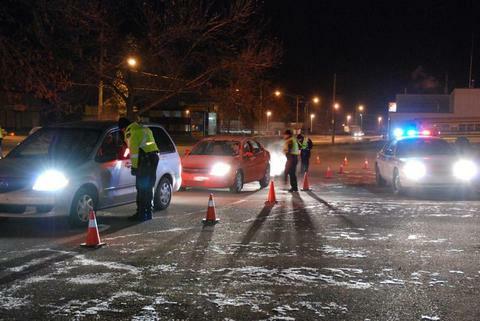 Depending on the result of the roadside test, the driver may have his or her driving privileges suspended for a period of time, or further blood-alcohol related breath tests may be conducted at a Saskatoon Police facility. Penalties for driving while impaired can range from fines and driving suspensions to jail terms. Of course, these types of penalties pale when compared to having to go through life knowing you killed an innocent person due to your own drinking and driving. 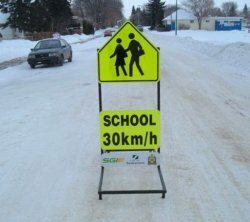 The school zone signs were constructed by Saskatchewan Association of Rehabilitation Centres (SARC), Saskatchewan Abilities Council and The City of Saskatoon sign shop. The signs are placed at each end of the school zone by a school official at the beginning of the school day and removed again at the end of the day. This project addresses the issue of speed management, where Saskatoon drivers fail to identify school zones and adjust their speed accordingly. These drivers are not only committing a speed violation, they are also decreasing the safety of the students, parents, teachers and citizens that are using these school zones. In other cities, these strategically placed school zone signs have been completely effective. The Traffic Unit is also responsible for the investigation of serious motor vehicle collisions and hit and run collisions. To this end, the unit uses a team of investigators specializing in both fields. Hit and Run investigators are experts at matching up damage between vehicles. They work closely with the auto insurance industry to bring hit and run violators to justice. 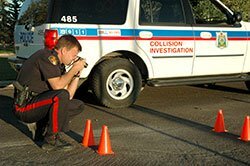 The Collision Analyst Unit is made up of a group of highly trained officers who are responsible for investigating serious injury and fatal collisions. These officers receive ongoing first rate training in various disciplines including physics, math, photography, forensic mapping and 3-D animation. In addition to this training, some members of the team have received specialized training in the investigation of collisions involving motorcycles, pedestrians and commercial vehicles. As our city grows, so does the amount of heavy truck traffic. 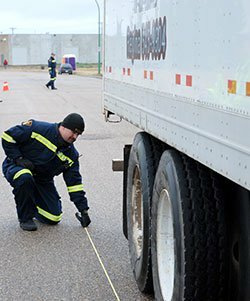 In order to ensure that the trucking industry is complying with safety and weight requirements, the Saskatoon Police Traffic Unit has members who are specially trained in the field of commercial vehicle inspection. The members are part of the North America wide Commercial Vehicle Safety Alliance (CVSA) and regularly conduct safety campaigns at various locations in Saskatoon. These officers may also be called to collision scenes involving heavy trucks to conduct a safety audit. Traffic safety concerns are a high priority for the Saskatoon Police Service, through an ongoing team approach, we are constantly striving to improve the quality of life and safety of all our citizens. Saskatoon, like other cities throughout the country, has received repeated complaints about excessive vehicle noise. The Traffic Safety Act prohibits vehicles from creating “loud and unnecessary noise” while the Vehicle Equipment Regulations require mufflers that “effectively reduce noise.” Both provide penalties for violations. The City of Saskatoon has gone further to protect its citizens from harsh and abrasive noises through amendments to Saskatoon Bylaw 8244 - The Noise Bylaw . The bylaw specifically addresses the manner in which some drivers choose to operate and equip their vehicles that result in unnecessary noise. Specifically, Section 5.1(a) addresses manner of operation. An example of this would be repeatedly increasing engine speed while stopped at a red light. Such actions would be considered unnecessary. Convictions have already been made under this section. Section 5.1(c) addresses motorcycle exhaust noise. Motorcycles off the assembly line already meet the industry standard for acceptable noise levels. Problems occur when owners modify their motorcycles with loud exhaust systems. Citizens complain about the excessive noise. The maximum allowable decibel levels are 92 dB(A) at idle speed and 96dB(A) above idle speed. Section 5.4 sets out as an offence a refusal to allow the police to test your motorcycle for sound. Motorcycle noise testing, education and enforcement are part of the SPS response to citizen concerns regarding excessive noise and its impact on quality of life. The Saskatoon Police Traffic Unit has purchased five sirometers, two sound meters and one anemometer. Information related to vehicle standards, windshield damage, vehicle modifications and motorcycle equipment standards can be found at the Saskatchewan Government Insurance website. Information about red light cameras can be found at the City of Saskatoon website.